Toughest job in movie making-put up an ensemble cast in such way that just no one can steal the show and even one is pulled off, its totally incomplete. That is the strength of Welcome to Sajjanpur. Directed by Shyam Benegal's simple and earthy tale of a village and its natives, is a noteworthy in terms of overall cast's performance and integration. The movie revolves around Mahadev [Shreyas Talpade] who aspires to become a novel writer but ends up writing letters for villagers, where hardly any of the villagers are literate. How he gets into lives of people, how he influence it and how does he cope up with it, that the movie is all about. Direction is flawless. Not a single moment is there, where i felt out of story, or any flaw in between. And thankfully the length of the movie is perfect. At 134 Minutes. Screenplay written by Benegal and Ashok Mishra, is like earlier Benegal movies. With social responsibility and fun mixed together.Like getting audience drink bitter medicine with sugar. Seamlessly weaved together are current issues in politics, daily life, Industrialization, widow and much more. Each point is bang on the target, making one start to think. Each and every characters are so well written and performed that I can not go ga-ga over a selected one. Surprisingly, I loved Ravi Kishan's performance. He is just so natural and the chemistry between him and Rajeshwari, that made me love both 'over' Shreyas and Amrita !!! Hilarious Subedar Singh [Lalit Mohan Tiwari] as a retired army personnel..
Ila Arun as 'Ramsakhi Pannawali' (!!!). Divya Dutta and Ila as daughter/mom pairing, made it memorable one. Music took me at another surprise. Its a shame on me that I don't have the soundtrack at all :( Lovely songs by Shantanu Moitra and words by his regular Swanand Kirkire & Ashok Mishra. My most favorite track, Meetha Marz de de.... picturised so beautifully, dreamy dreamy sequence. And finally, in climax a surprise cameo !!!! All in all, I really really liked the movie. Its a meaningful cinema as always by Benegal, and still its so endearing that one can easily rewatch it again. My rating is 4.5 out of 5. It all started with an Email. 2years back, I received an Email from my friend. It contained such lovely poems, I couldn't resist and read them all. Otherwise, I always delete such 'forwardiya' mails. And after getting much impressed by words, at the end of mail, it was written-beautiful poems from movie Socha Na Tha !! I was shocked !! Man, this movie I have missed?? How could I? I never gave importance to even watch that movie when it was released cause it was from Deols, whom I wasn't looking fwd to, those days. Also, publicity was so low-key, that not much people knew that a star-relative is launched. Instantly I got to the music store, got the CD and man on next day, I rented the movie and totally fell for it. That, was power, for me, of Sandesh Shandilya's absolutely lovely tunes and Irshad Kamil & Subrat Sinha's mesmerizing simple words. Socha Na Tha  is a cute little lovestory of Abhay Deol and Ayesha Takia. Directed by first time director Imtiaz Ali. More about movie is here at Shweta's post. Sandesh Shandilya [who debuted with two superhit songs in K3G, 'suraj hua madhdham' and 'you are my soniya'; and later fabulous album of Chameli,] has created such fresh tunes I can never get tired of listening. Lyrics are so simple, like conversations-that makes songs so very special. Hit the play button to listen to the album. Album starts off with catchy 'Yaara Rab' sung by Sonu Nigam and Sanjivani [who did fabulous Chori Chori jab nazrein mili : Where is she now?]. A duet for runaway couple ;-). Tappy beats of Tablas makes it pacey a little and fresh vocals, especially Sanjivani who suits perfectly as voice of cute Ayesha (<3 <3) makes me hit repeat button again and again. Next up is 'Abhi Abhi mere dil mein': Ahh..no its not remake of 'kabhi kabhi' but its a beach song. To be specific, Goa Song. With Portugese beats, song makes it perfect for a Goan holiday. Sung by Sonu, Sunidhi and Kunal Ganjawala. The song is written by guest Lyricist Subrat Sinha. Next up are my most favorite words of the album: Na Sahi sung by Sandesh himself. Irshad weaves of words so well, and Sandesh too gives absolutely interesting rendition. Cause it is always tough to give music to unusual poetry unlike rhyming words like regular bollysongs. That thing again is reflecting in next track. Another favorite of mine : 'Mera Tumhara'. It has got so so unusual words to be put in a song, but here Sandesh wins accolades. And so surprising that this song is written by Subrat Sinha, whose earlier track 'abhi abhi' is so much different then this. Love love these two songs. Both has distinctive 'Abhay Deol' feel. Here are the lyrics. [I got 'these two and the title song' in my mail, that made me flattered] This song is also sung by Sandesh, and gosh..his voice is so great I just wish he sings more often. Next Track 'Zindagi' is quite fast track. And again with fun lyrics like 'abhi abhi'. Its a party song with interesting Rhyming words throughout the whole song. And somewhat breathless singing. Sonu and Sunidhi alongwith Lalit Bhushan, does fantastic singing. I wonder how much retakes they must had taken. For singing such a tricky track. And if all this fab tracks didn't do enough for me, there came Grand Finale. A song sung by my most fav -Sadhna Sargam, a duet with [again] Sandesh Shandilya. 'Socha Na Tha' a song for lovers who still don't know that they are in love. And this song reminded me today, that it can be perfectly placed in JTYJN. Isn't it?? [an idea to write another post !!!] Song starts with deep voice of Sandesh and concluded by Sadhna-ji. In her own sweet singing, making the album absolutely special. Its here. Its here. World's cheapest Car, the 1 lakh car or whatever.....is here. Tata Nano. Bookings are started. And what made me laugh was this - They will produce 1 lakh cars in first phase. And for that 1 lakh cars, Tatas has set up more than 30,000 counters to sell Booking forms !!!! Only 4 forms per counter would get 1.20 lakh forms !! Heck...and they are racking in moolah by 'selling' forms at 300 bucks !! And worst is - till the year end no one is seems to be getting it. So there, is 'People's Car'. 'Nano' Barse Rimjhim Rimjhim: |Woh Kaun Thi| When the car is finally out and its showering in showrooms. Jab se Tere 'Nano' :|Saawariya| Guy falling in love, at first sight of this cute little car ! 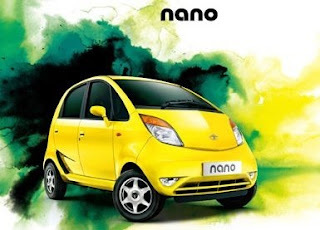 Sapno Se Bhare 'Nano' :|Luck By Chance| Guy dreaming all the time, of buying it ! 'Nano' Mein Badra Chhaye : |Mera Saaya| Finally, bought it. And on the very first day, it rains rains and rains. Tere Naina Mere 'Nano' se : |Bhrastachar| And while its raining, At traffic jam. two eyes meet [I mean four :) and in my case there will be six :D ] . Tere 'Nano' : |Chandni Chowk to China| Umbrella opened. And car too starts flying with the couple. Singing the lovely song. 'Nano' Thag Lenge : |Omkara| Guy gets back after 'dream sequence' mentioned above. And girl in next car, meet up guy next lane, who's riding a Hayabusa. Feeling cheated he sings this one. Guy, depressed. Cause even a bike is costlier and happening then his car :( He gets home, and suddenly sees that girl at his home. She tells, 'Mera kuchh samaan....aapke dicky mein pada hai'. Guy searches, but can't find. He asks : "Ma'm, ummm....what's ur name?? There is nothing in here...."
Guy Faints....................Hayyyyyeee...................my car rocks !!! 'Nano' Mein 'Sapna' : |Himmatwala| A full on, bollywood song. With all the pots, colors and chiffon sarees flying all over. Finally, I have started watching Films I've missed in 2008. And that too, after 'pinching' of thebollywoodfan. Who reminded me by his excellent post about this movie. And all his words lead me to nearest shop and I got Tahaan on second day itself !! Here is my quick review of this lovely fable. Tahaan directed by ace cinematographer Santosh Sivan, is an excellent piece of film making. On a little scale, he puts this vast canvas of Kashmir. It has been ages since we saw Kashmir like this. My God !! What we are missing... After Dil Se, in which Santosh had captured beautiful Ladakh in his lense, here he beautifully uses his brush to color the canvas of the screen. Its like reading a fable from our school time story cupboard. The Fog and smoke creates 'wow' visuals on screen. Love it. Naturally, the story is somewhat based on militants and army. But moreover its a story about Tahaan - the central character's quest to get back his beloved donkey, Birbal. And over this quest He gets to see and learn many things. Also a surprise too....Purav Bhandare who plays Tahaan, gives absolutely heart warming performance. Below is one of the scene, I loved of him. Victor Banerjee as his grandpa is in a short but again touching performance. He reminded me of my childhood when we used to listen stories from my grandpa. Sarika is always a delight to see on screen. She is mute mother of Tahaan. And she does talk with her eyes a lot. Anupam Kher whose role I thought would be negative, but I was wrong. And again his character is well written and he performs well. And, who else can talk about pain of Kashmiri Pundits then him? Rahul Bose, in an unusual one, is also too good. Everyone, just everyone has given a top notch performance. Even Rahul Khanna in his 5 mins. appearance, reminded me of the old time 'lalas' [ala Mother India]. And above all, the endearing performance of Birbal-the donkey. Technically this movie is so brilliant. Everything from production design to cinematography to outstanding sound design, is just too perfect. I loved these two little scenes with some lovely folk music. All in all, its a must must see movie. These kinda movies are a rare genre and thank God *it is*. Now, I got more expectations from Sikandar. And lastly, here are some screencaps of the movie, featuring lovely people of Kashmir. After 'overwhelming' response to my earlier 'Monday Masti' post, I am thinking of making it a regular [if I can 'think' new ideas, then only]. So here is another one. And thats so obvious, about Aamir and Ghajini. While re-watching it on DVD, I noted various 'aspects' of Aamir ;-) . Here are some..
Well,not 'all' guests are God for Sanjay...see below.